Murders of transgender people are on the rise. On this Transgender Day of Remembrance, we reflect on the lives lost and the work that still needs to be done to protect the living, says Alex Hopkins. Early in the morning on January 22nd, 2016, at a residence in Austin, Texas, the roommates of a trans woman, Monica Loera, heard gunshots ring out. Monica Loera had been shot and killed. Only this month her killer, JonCasey Rowell, was convicted and sentenced to 20 years in prison. At Monica’s trial, it emerged that Rowell had carried out internet searches for “transsexual escorts” in the hours before the murder. Monica’s story is not unusual: she is one of over 20 transgender people who have been brutally killed in the United States so far in 2017 – a year in which murders of transgender people have risen to an all-time high. According to Glaad, the world’s largest LGBTQ media advocacy organisation, there has been a steady rise in murders of transgender people in the United States over the last five years. Glaad reports that there have been at least 23 known cases of hate-related homicides of transgender people. Of those cases, 20 were transgender women with 95% of those victims being women of colour. 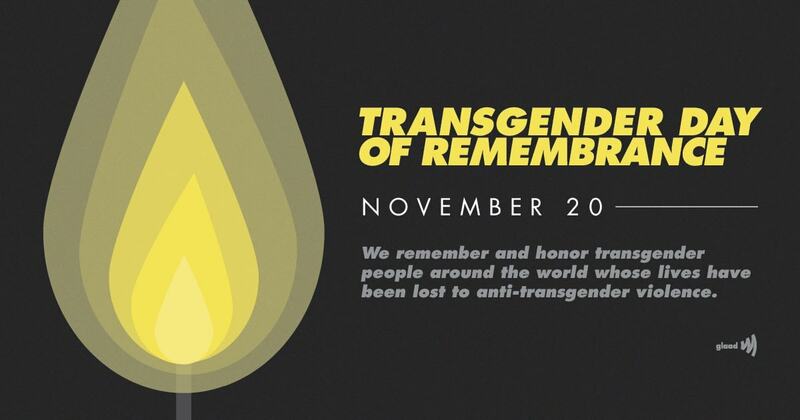 On November 20th, we will remember all of these victims – and all those subjected to violence and prejudice as part of the annual Transgender Day of Remembrance. The day was established by transgender advocate Gwendolyn Ann Smith as a vigil to honour the memory of Rita Hester, a transgender woman who was killed in 1998. While the victims documented by Glaad represent the most extreme form of violence against transgendered people, other sources also point to an increase in discrimination and other hate crimes. According to the 2015 U.S. Transgender Survey Report, almost 50% of all respondents reported being denied equal treatment or being verbally harassed or physically attacked in the past year because they were transgender. Only by stamping out every form of harassment against transgender people can we begin to address this tide of violence. Every case of transphobia must be thoroughly investigated, and those responsible for it brought to justice. The onus is on us all to ensure that the relevant authorities take all allegations seriously and act appropriately. Violence does not happen in a vacuum – it's facilitated by societies in which prejudice and discrimination against others are allowed to fester unchallenged. Trans visibility is crucial to confronting hatred – and we all have a responsibility to ensure that everything possible is done to ensure that trans people are safe in the same spaces like everyone else. This is one of the fundamental tenets of equality. Yet, all too often transgender people feel that they must police themselves whereever they go, fearful of verbal or physical assaults. Anxiety is never far away. As well as serving as a day to remember all those transgender people who have been killed, transgender day of remembrance exists as a day on which trans issues must be put in the foreground as powerfully as possible. It is an opportunity for us to regroup, to assess the progress that has been made – and address all that must still be done. Our task is to find the most appropriate ways to achieve this – for only in doing so can we begin to shape attitudes for the better. In Palm Springs on November 20th, the first ever Transgender Day of Remembrance Cenotaph Statue will be unveiled, a life-size sculpture inspired by the death of trans woman Yaz’min Sanchez, who was shot and burned behind a rubbish bin in Florida. This public, permanent reminder of a life so cruelly dismissed will finally bestow upon the victim the respect which she deserved – respect which was so sorely lacking in her short life and the appalling circumstances of her death. The unveiling of a statue is a uniquely powerful moment of stillness and reflection. At that moment, all else stops: our attention is focused solely on the individuals whom that figure represents. As our gaze falls on the memorial for the first time, we’re reminded of our common humanity. As we come away from that silent moment, we're given a choice about how we conduct ourselves in the future. We can stand by and ignore the wrongs done to our fellow human beings, or we can come together and confront all discrimination and hatred with one unfaltering voice. For the sake of our trans brothers and sisters, let it be the latter.